Are you looking for transport to get you to and from appointments or the shops? Look no further. Door to door service is our specialty. Our friendly volunteers make it their priority to get you to your appointment in comfort and on time, no matter the location. 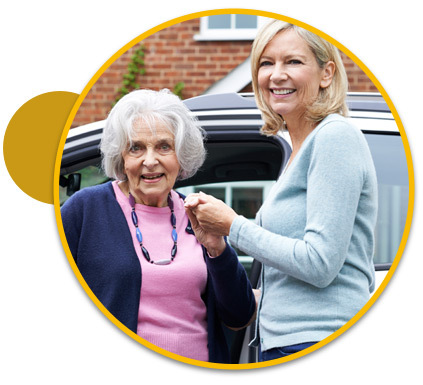 We offer transport for a variety of other purposes such as visiting your partner in hospital or aged care facility, visiting friends, getting to the airport, or getting to your volunteering commitments. You may also want to join our group shopping buses. Our volunteers transport you from your home via small, comfortable buses to various shops and centres on a pre-arranged schedule. Once dropped off you have two leisurely hours to do your shopping, grab a coffee, or window shop, before being collected for the journey home. Transport services are available 8.00am to 4.00pm Monday to Friday. You can book your required service as early as one month before it is needed or up to 3 days before. Please note that our services are heavily supported by volunteers and occasionally services are restricted due to volunteer availability.